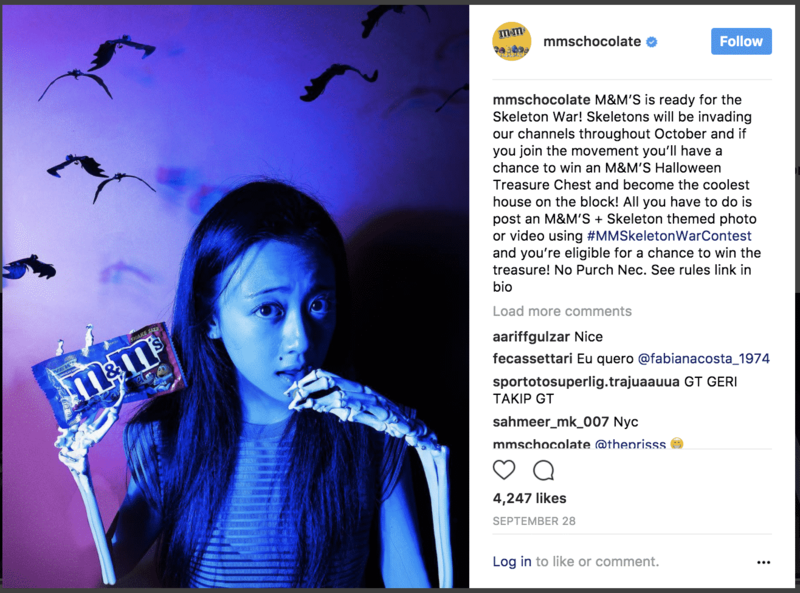 If you’ve been looking for great Instagram marketing examples to inspire your own advertising efforts, you’re not alone. The growth of advertisers on the social network has exploded since last year. In March 2016, there were 200,000 monthly active advertisers. In 2017, that number has grown to more than a million. 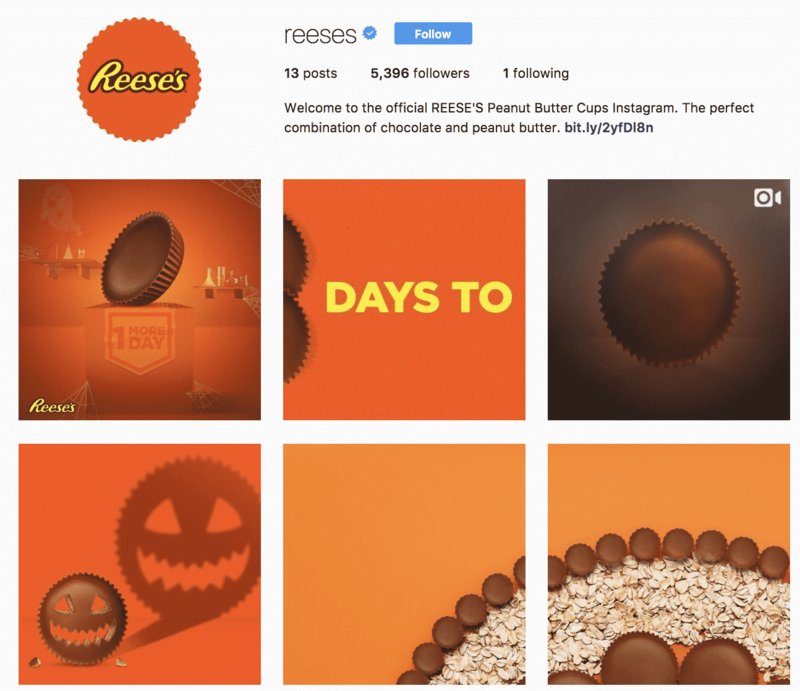 So, wherever you look, you can find Instagram marketing examples. But some of the most effective examples are seasonal. 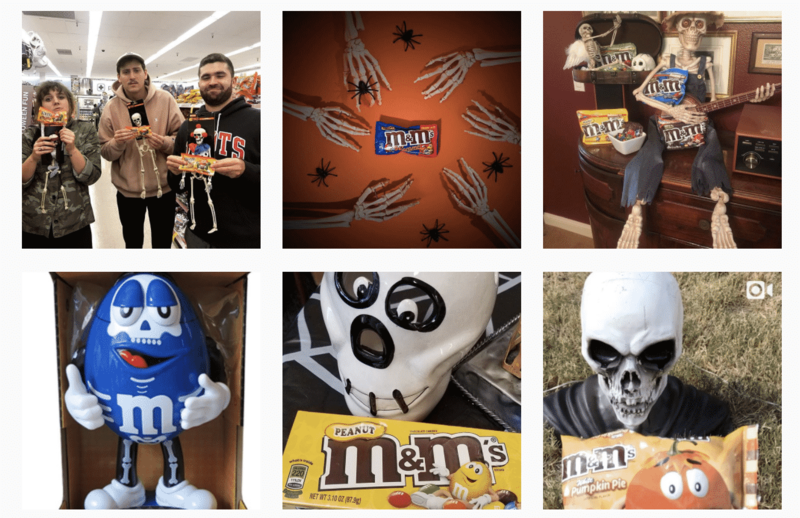 When it comes to Halloween, ghouls, ghosts, and goblins may dominate office parties far and wide, but it’s candy brands that really crush it on social media. 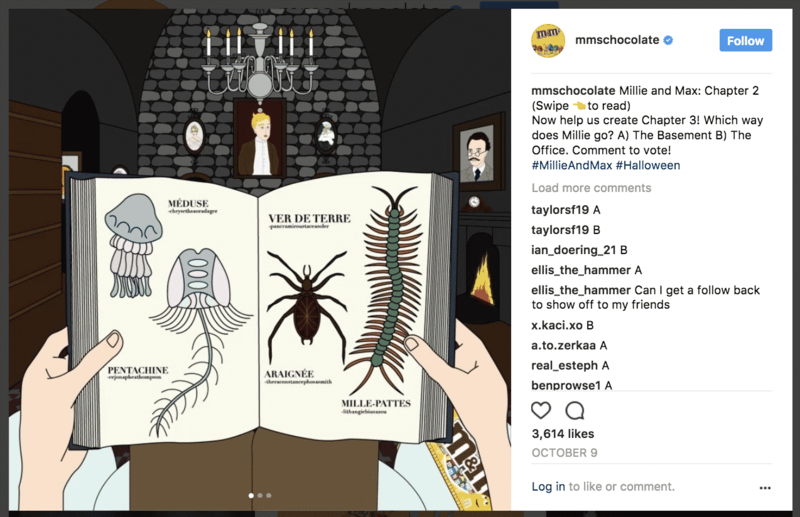 From costume contests to interactive stories, here are six awesome Instagram marketing tactics from the sweetest campaigns we saw this October. Run a user-generated content contest. Contests are a great way to engage with your audience. Especially when they rely on user-generated (read: zero production for you). Take what M&Ms did for Halloween. They launched a “skeleton war” on September 28 to build enthusiasm in the run up to the spooky holiday. 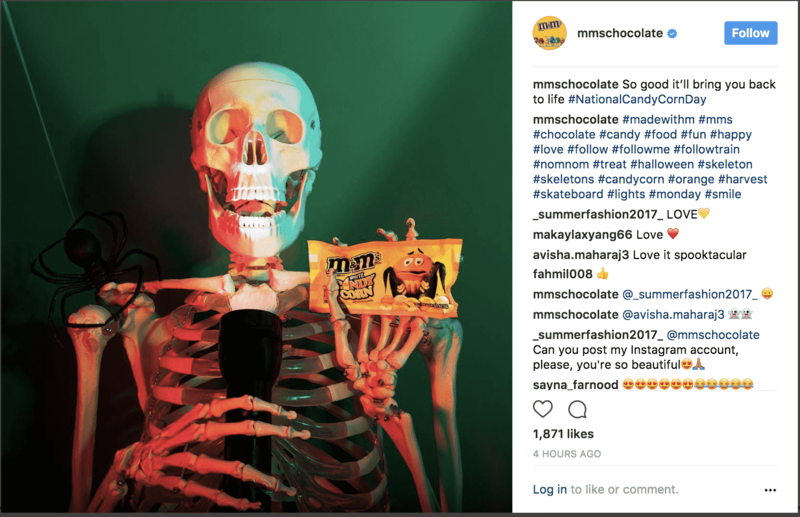 Throughout the competition, the classic candy brand encouraged people to share their skeleton-themed photos and videos by posting them to their social media accounts using the unique hashtag, #MMSkeletonWarContest. To date, there have been 8k+ social media interactions with the hashtag so far. Having people post their own content helps grow brand affinity and enthusiasm, since consumers are thinking more deeply about what the product and the theme actually mean to them. Nurturing that kind of personal connection is key to turning one-off buyers into lifetime shoppers. Share creative ways to use your products. It’s helpful for shoppers to see the different ways they can use your products, so give the people what they want! In the case of sweets, you can use them in cookies, cakes, and other creative recipes. Usually, the end results are endless and easily ‘grammable. 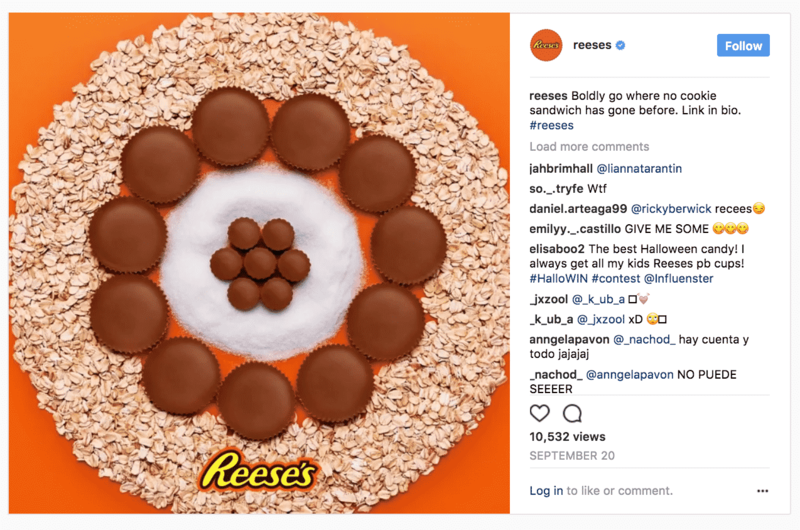 Reese’s took over their entire Instagram profile page on September 20 to focus excitement on an extra special recipe, placing a fun how-to video smack dab in the center. If you’re a fashion brand, you might offer up how a little black dress could be styled for a cocktail party, girls night out, or work event (e.g. kill the blazer, add a leather jacket, swap your flats for heels). If you’re a beauty brand, showing your shoppers how to kick a conservative look up a notch for date night (add lipliner, gloss, and another swipe of mascara) is useful information your followers will love. Educational, instructive content builds a relationship with your brand and offers followers something useful, instead of just a post about your brand. Want to really engage your Instagram followers? Build interactive content that lets them choose what happens next. 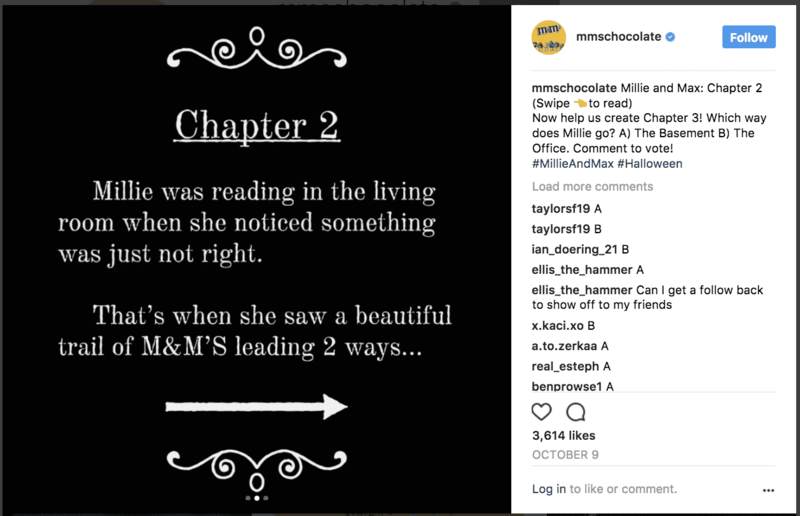 M&Ms produced a Halloween story, published through a series of Instagram posts, where people could vote on the next chapter for the main character, Millie. Logistically, putting the text in the second panel of each post keeps people engaged (since they have to swipe left to read it) and has the added bonus of not cluttering up your caption. It’s clear from glancing at the M&M profile page which entries are ghost story chapters. Employing this strategy allows you to post other Instas throughout a dedicated campaign, without annoying fans by breaking up the narrative. Build excitement with a “stay tuned” message. Kit Kat posts a lot of great videos on how to get your “break”, like through karate, drums, and games. 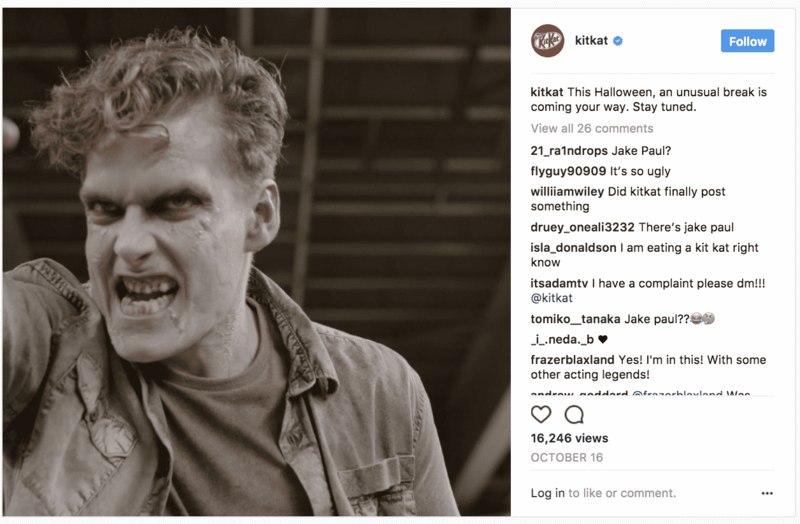 For Halloween, the brand created a series of short videos to build zombie-themed suspense for the reveal. 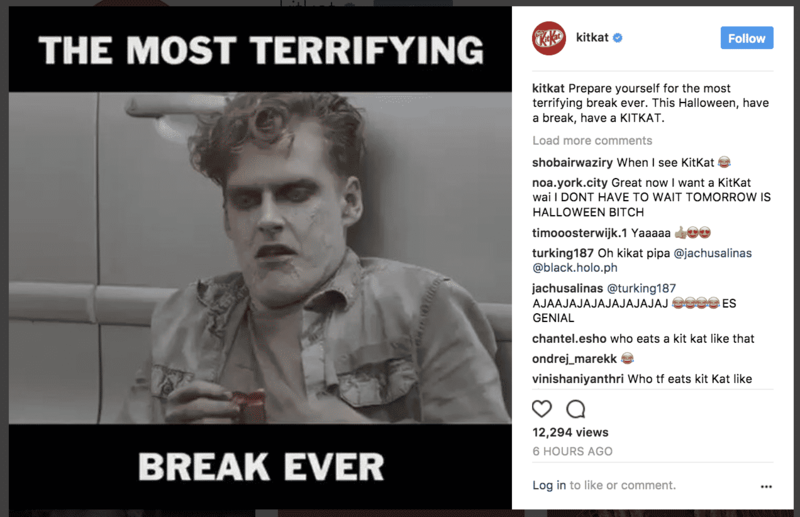 When we finally see the reveal — basically a zombie devouring a Kit Kat bar in an alarmingly gruesome way — he makes it look so delicious, it actually really makes us want a Kit Kat. Don’t forget about other holiday hashtags. Hashtags help amplify the reach of all your Instagram content. You don’t want to overdo it, but brands can tap into new audiences by creating content related to popular hashtags. Even seasonal content. 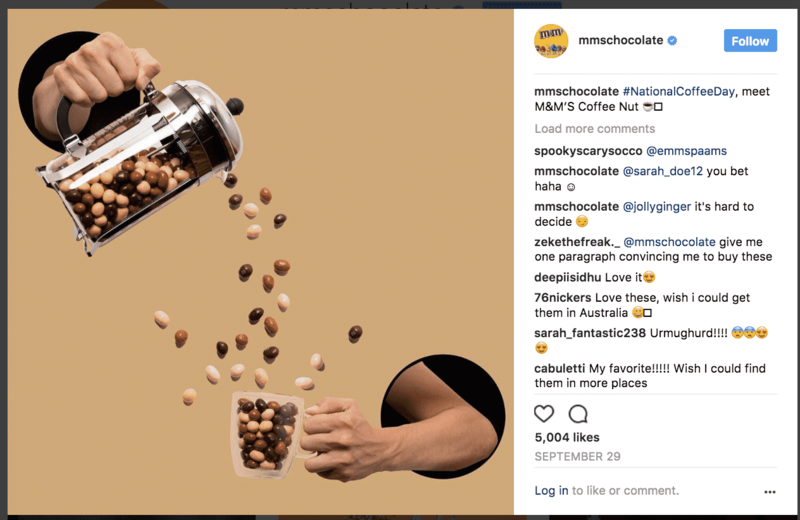 M&Ms does a great job with this, creating relevant content for hashtags like #NationalCoffeeDay and #NationalCandyCornDay. Just because it’s a seasonal period doesn’t mean you should ignore other social media holidays and trends, since those could be opportunities to reach a different audience. For all you know, there may be a bunch of coffee fans out there who never even knew there were java-flavored M&Ms. Hook into pop culture phenomenons. If you really want to expand your audience, try creating content that’s relevant to the latest pop culture trends. 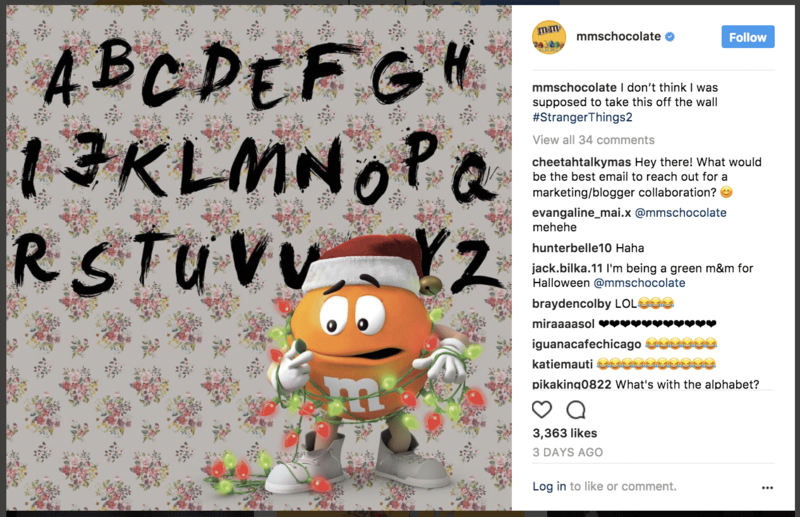 M&Ms did this by doing a cheeky Instagram spotlighting season 2 of “Stranger Things”. In case you missed it, it’s the Netflix original you may have been hearing about, a sci-fi drama set in 1980s Indiana that’s currently scaring grown-ups everywhere. Chiming in on larger trends, like entertainment sensations, keeps your brand in the conversations your audience is already having. And that means they’ll be listening to what you have to say, too. Social media marketing is a powerful way to drive brand awareness and advocacy, but it’s just one part of a larger omnichannel strategy. To meaningfully connect with shoppers throughout their path to purchase — now and in the future — you need to reach them with great content at every stage of their journey. For the ins and outs of how to build a comprehensive omnichannel strategy all year long, check out our Smart Marketer’s Guide to Omnichannel.